Born in a large French Canadian family, December 25, 1948, in Montréal, Québec. Primary and Secondary schooling in English school-system. In 1961 had his first contact with Russian Orthodox Church in Rawdon, Québec at the summer church of Saint Seraphim of Sarov (under the Cathedral of Sts Peter and Paul in Montréal). On January 20, 1967, he was received into the Church by His Eminence Archbishop Vitaly (ROCOR), and until 1971, he participated in the parish life at Saint Nicholas Cathedral in Montréal. During this time, he participated in the activities of the McGill University OCF. In 1971, he completed his B. A. in Slavic Studies at the University of Ottawa, and then joined Holy Trinity Monastery in Jordanville, N. Y. He was blessed as a novice by His Eminence Archbishop Averky, and was under the spiritual direction of Archimandrite Kiprian. In March 1974, after three years of study at Holy Trinity Russian Orthodox Seminary, he was tonsured a Rassophore Monk by Archbishop Averky. A year later, in March 1975, he was tonsured a Stavrophore Monk by His Grace, Bishop Laurus, and received the name of the Hieromartyr Irénée of Lyons. Shortly after that, he was tonsured Reader, and ordained Sub-deacon by Bishop Laurus, to help the ailing Archbishop Averky serve at the altar. In February 1978, he was blessed by Bishop Laurus, then the new Abbot of Holy Trinity Monastery, to go to serve in France, in the French-speaking parishes there. He was ordained Hierodeacon on May 19th, 1978, in Brussels, Belgium; and Hieromonk on August 20th of the same year, in Geneva, Switzerland by His Eminence Archbishop Antony of Geneva. After serving 4 years in Lyons, he returned to Montréal, Canada , to serve the French Mission there. After the election in 1986, of His Grace, Bishop Seraphim (Storheim), as Auxiliary Bishop for the Archdiocese of Canada (OCA). Hieromonk Irénée, Hierodeacon Marc (Pierre), and members of the French Mission in Montreal petitioned to be received into the Canadian Archdiocese of the OCA. He was elevated to the rank of Higoumène (Igumen) by Bishop Seraphim in 1992, to care for the French speaking monastics in Québec. In 1993, he was assigned as priest in charge of the Saint Benoît French-speaking parish in Montréal. He served also as supply priest in many parishes in Montréal, Ottawa, Toronto, and Québec City. In 1996, he was assigned as Administrator of the Russian Cemetery, and of Saint Seraphim’s Russian Orthodox parish in Rawdon, Québec, an obedience which he fulfilled until 2007. Throughout, until his secular retirement in December 2008, he worked full-time in a local Montréal hospital. 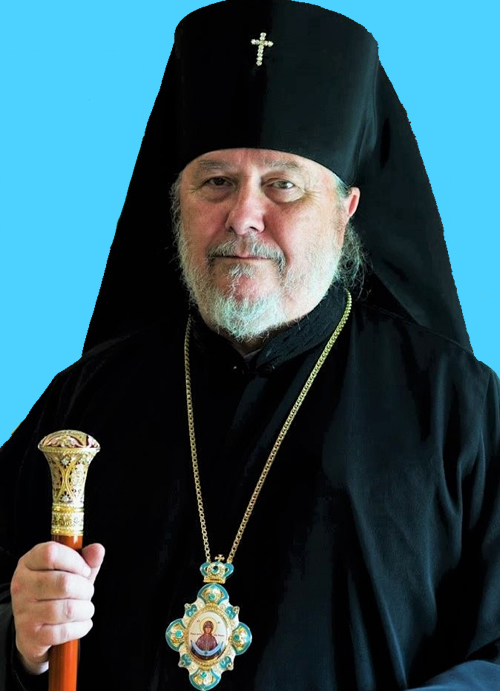 On April 2, 2009, the Holy Synod of the Orthodox Church in America, elevated Higoumène Irénée to the rank of Archimandrite, and elected him to be Auxiliary Bishop for His Eminence, Archbishop Seraphim of Ottawa and Canada, with the title of Bishop of Québec City. On October 21, 2014, the Holy Synod of Bishops of the Orthodox Church in America elected His Grace, Bishop Irénée as Bishop of Ottawa and the Archdiocese of Canada. On March 20, 2015, during the Spring Session of the Holy Synod of Bishops of the Orthodox Church in America, Bishop Irénée was elevated to the rank of Archbishop of Ottawa and the Archdiocese of Canada.